A peat bog is an ancient place where water and earth combine over thousands of years to form a rich, organic archive. 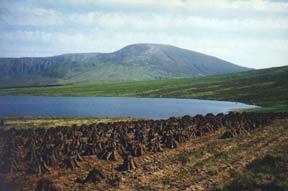 Although today we realize the importance of bogland preservation, for generations peat (turf) was harvested in Ireland and burned for fuel and warmth. Tidhigh An Phorta "fire on the bog" evokes the paradox of fire and water and encompasses earth and air inspiring the image of a slow-burning fire, difficult to extinguish. With these thoughts in mind, and remembering our personal experience cutting turf in the foothills of the Ox Mountains in County Sligo, we gave our creative endeavors the name Bogfire. Bogfire encompasses a wide range of activities which we hope you will enjoy learning about in the pages of our website. From design and photography to traditional music and cultural exhibits, we strive to celebrate the creative spirit. Photo © 2000 James Fraher. All rights reserved. After visiting our site, you may enjoy exploring other relevant sites. Click here for our favorites.